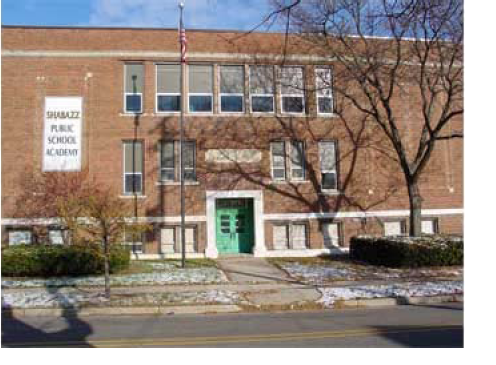 Located on a grassy corner lot with plenty of shade tree and shrubs, El-Hajj Malik El-Shabazz Academy is housed in a medium-size, red brick school building that was once the property of the Lansing Public Schools. The structure has historical significance in the community because it was once the elementary school that Malcolm X attended. El-Shabazz enrolls approximately 181 children in kindergarten through sixth grade and is one of the five charter schools operating in Lansing, Michigan. Ninety-eight percent of the student body is African-American, with 100 percent of the children considered to be at risk of failing in school. Most of the children are from single-parent homes or foster homes, with approximately 77 percent qualifying for the free-or reduced-price lunch program. El-Shabazz occupies the rear section of the red brick building it shares with a private Christian school. The two organizations are completely autonomous and operate in opposite wings of the building, sharing the use of the gymnasium/cafeteria, the parking lot and a grassy field that serves as a playground. A plastic sign with removable letters announcing the latest Shabazz events greets traffic on the west side of the building, which borders a moderately busy street. The Shabazz wing contains seven classrooms, a computer resource room positioned into separate spaces for working with students, another large room partitioned into four office spaces, the principal’s office, and two small rooms used for vending and copying machines, storage, and general spillover. A common hallway connects all the rooms and leads, through double doors, to the wing that contains gymnasium/cafeteria. A side from two glass display cases of impressive African artifacts and assorted mounted photos and carved reliefs of the African diaspora that line about a third of the Shabazz hallway, the physical environment looks and feels like that of a traditional public school. There is only minimal student work on display on the walls outside and inside the classrooms, and classroom layouts are fairly typical in their various integrations of teacher personality and institutional norms. Kiswahili language instruction is sometimes offered, along with a heavy dose of African American history. But other than this, the Shabazz educational program adheres closely to the Michigan Department of Education requirements. At El-Shabazz, we believe that … all students are entitled to a quality basic education. Hence, our school’s curriculum stresses high achievement in the fundamentals of mathematics, reading, speaking, writing, and science. These disciplines, in our opinion, can be mastered by all students, but not at the expense of not being knowledgeable about their heritage, culture, or history. Consequently, we embrace an Afro-Centric approach to all of our student-centered initiatives. African centeredness is the placement of African American people and students at the center of human process. This is based on the belief that all humans have their physical, social and intellectual origins in Africa … Therefore, African Centered Education is an approach which celebrates the culture, heritage, contributions and traditions of all humans … With African Centered Education, the African American child is culturally placed at the center of the learning process, whereas with Euro-centric Education, they are culturally outside of the educational experience … Looking at the school system in America, Euro-centric education has failed to meet the needs of African American students. There is a gap existing between the test scores of black children and white children … Contributing to this gap are low expectations for African American students, the labeling number of African American boys being placed in special education and behavior disorder classes which places the students in an at-risk environment. Additionally, the high drop-out rate across the country within urban educational centers pinpoints the need for a more culturally appropriate education thrust. African Centered Education is an educational experience, that utilizes African and African American cultural and intellectual traditions and processes in guiding the teaching and learning experience. It is both the philosophy and the practice which guides the process of teaching and learning … [The school is guide by the Ancient African principles of], Nguzo Saba … a term popularized by [the African-American activist and academic] Dr. Maulana Karenga. As part of Karenga’s Kawaida philosophy, the Nguzo Saba are seven principles (Umoja, Unity; Kujichagulia, Self-determination; Ujima, Cooperative Work and Responsibility; Ujamaa, Collective Economics; Nia, Purpose; Kuumba, Creativity; and Imani, Faith).